It might have been the perfect jolt for Jake. Six years ago, Tammy Botsford of Chestermere, Alta., bought her Paint gelding, Jake, as a yearling, and the pair enjoyed a pretty decent – if sedate – run in the show ring. By contrast, last year’s inaugural Calgary Stampede Cowboy Up Challenge – the first Extreme Cowboy Racing event on Canadian soil – was like a pure charge of electricity for Botsford and Jake, whose show name is Dez Add To The Assets. 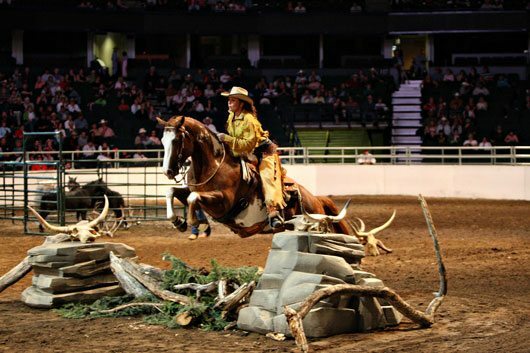 In an event that demands horsemanship and speed in equal measure, before a charged-up crowd at the Scotiabank Saddledome, Botsford and Jake teamed up to win the Cowboy Up Challenge’s first go-round with 96.25 points – qualifying for the 12-team championship final, and eventually finishing 10th overall. Botsford and Jake are back for more, with the second annual Calgary Stampede Cowboy Up Challenge set to take over the Saddledome from Saturday, July 9 through Monday, July 11. Saturday and Sunday will feature the two preliminary rounds, with 14 horse-and-rider teams. The top 10 in point standings, and two wild-card entries, will return for Monday’s championship final. Start time all three days is 3 p.m. The winner receives a cheque for $7,000 and a handcrafted Stampede champion buckle. Botsford is one of eight Canadians in the fray, a number that includes the event’s inaugural winner, Glenn Stewart of Baldonnel, B.C. Six Americans are also entered, including Extreme Cowboy Association (EXCA) heavy hitter and 2010 Cowboy Up Challenge runner-up Robin Bond of Vista, Calif. Extreme Cowboy Racing, sanctioned by Bluff Dale, Texas-based EXCA, is the brainchild of Craig Cameron, known as the “cowboy’s clinician,” and originated as a TV program in the U.S. It’s the fastest-growing sport in the equine industry; more than 100 EXCA events were held in 2010 from Hawaii to Alberta to Maine. A timed and judged event, Extreme Cowboy Racing demands both horsemanship and speed, and challenges both horse and rider with an obstacle course that may include such challenges as moguls, bridges, log crossings, tunnels, cowboy curtains, roll backs, and water crossings, among others. Judges award points for each obstacle, on a scale of one to 10, based on criteria such as horsemanship, cadence, control, and overall execution. Horse-and-rider teams are required to complete each obstacle within a predetermined time period to collect points. Botsford, who has participated in both editions of the spring Craig Cameron Extreme Cowboy Race Clinic at the Corral on Stampede Park, ended her competitive season last November by travelling to the EXCA world championship at Topeka, Kansas. An interesting experience, to be sure. While EXCA’s sanctioned events in the U.S. feature Pro and Non-Pro riders, the Cowboy Up Challenge will see its horse-and-rider teams go head to head, with no divisions based on gender or experience. And with the intimidation factor and first-year jitters no longer an issue, Botsford and Jake will hit the Saddledome course at full tilt. “During that first round last year, I had no clue who anyone was – Robin Bond, Kelly LeBlanc, all the big names from down in the States,” she says. “Maybe that was a bit of an advantage, because I wasn’t being psyched out. After the 2010 Cowboy Up Challenge, no one’s asking those questions anymore. The Stampede will be webcasting all events being held in the Saddledome and the Big Top this year. Visit http://ag.calgarystampede.com/saddledome-ustream-2011 for live streaming of Saddledome action, and http://ag.calgarystampede.com/big-top-ustream-2011 for events under the Big Top.